Like the politicians like to say : "It is the Economy stupid." I hereby create the phrase : "It is Normal Climate Change stupid." I have avoided joining this thread so far because, as most of you know, i do not believe in Global Warming under the standard definition of it being something that "IS CAUSED BY MANKIND." There is an ebb and flow to the changes in ICE in Greenland. In the past, it was greener than it is now, but ALSO, even farther in the past, Greenland was under miles of ice much thicker than mankind has ever experienced. Greenland is at that "special place" heme-spherically on Earth, just like that Earth is in that "special orbit" in comparison to the other planets around the SUN. 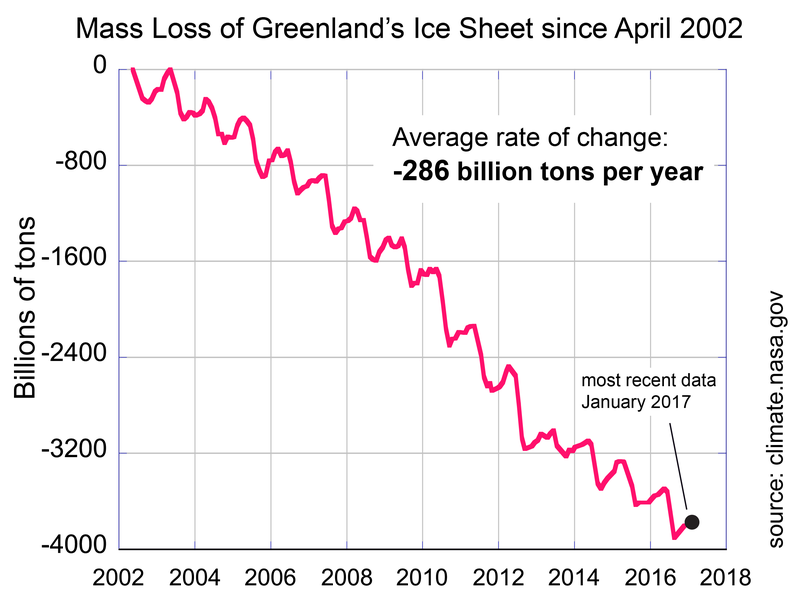 What is happening in Greenland is just another piece of Normal CLIMATE CHANGE that has been going on for millions of years and will continue to do so for millions more in the future. Back in the 1970's, everyone in Science and the Media stated that the Earth was facing another ICE AGE in the future..? ICE AGE: Remember that ? Are we going to state that all of those glaciers retreated because the Neanderthals learned how to use fire ? What is happening in Greenland is just a continuation of that retreat. Recently, there have been several articles stating the MAGNETIC NORTH POLE is moving ( IT IS ), and that it MUST BE because of Global Warming.....! I do not recall the exact details, but if i recall, back in the 1960's i read that scientists, (REAL SCIENTISTS, NOT THE PC CHUMPS WE HAVE TODAY), had discovered that thousands of years ago, the MAGNETIC NORTH POLE USED TO BE IN THE MIDDLE OF THE AFRICAN SAHARA DESERT..........! That interested me at the time because i was born not far from there in Morocco. So tell me, if the Magnetic North Pole used to be in Northern Africa, and moved to it's current position at the top of the Northern Hemisphere, and all of this happened thousands of years before Mankind invented fire, HOW CAN THE CURRENT MOVEMENT OF THE MAGNETIC NORTH POLE BE BLAMED ON THE ACTIVITIES OF MANKIND ? The answer is that it cannot. And in that same way, what is happening in Greenland is just a normal part of the continual evolution of the Planet Earth. In conclusion, over the last few decades, there has been a dramatic increase in the number, and strength, of EARTHQUAKES on the "circle of fire" around the Pacific Rim. It is my belief that what is happening there is far more important to Mankind, and our ability to survive on this planet, than what is happening in Greenland. That's actually called Anthropic Global Warming (AGW). Global warming by a "standard" definition is simply when the planet's temperature gets measurably warmer. Hmmm, not too much flow. People lived on Greenland around 4500 years ago because the coastal areas have been habitable since that time and were only affected by seasonal snow accumulations. There is no science available which supports that view. (2) The chart you posted is so ridiculous, as it covers a mere 16 years. What is really going on here has been going on since the creation of this planet, and you want to make judgments on such things with such a silly chart. irrelevant.. The chart you posted is so ridiculous, as it covers a mere 16 years. What is really going on here has been going on since the creation of this planet, and you want to make judgments on such things with such a silly chart. irrelevant.. The technology to reliably determine this data did not exist before this date. The chance is pretty good that I have read it, and can link to it, if it exists. If you can show me any science to confirm your statements I would be grateful. So what. These influences have been present for billions of years and nothing you say is consistent with the facts. So what. .... nothing you say is consistent with the facts. You are looking in the mirror. As for your statement that "nothing you say is consistent with the facts", the exact opposite is true. What i wrote is consistent with the facts, what you wrote is factless other than a silly chart with limited numbers, taken out of context. The bottom line is that Greenland will be fine, and the people there will adapt to the normal climatic changes that are occurring. You need to provide facts. You do not. I consistently show you know nothing about climate science and you consistently post nonsense. Neither I, or anyone else on this forum needs to provide you with anything. The only thing you "consistently show" is that you are self-absorbed, have the liberal syndrome of "you believe what you want to believe", and have an unusually high opinion of yourself. Some day you may want to climb down from that ivory pedestal that you have placed yourself upon, and join all us normal people who can have conversations without conflict. Then do not lie about having "facts" when you offer none. It really is that simple. I do not know what the above symbol combination means ? Some posts simply cannot be responded to in words although to be fair Red had a good go at it. Well, if it is an insult, which is what i interpret your answer to be saying, then back at you, whatever it was. Its a bit like when I watch my son do a silly show off dance round the lounge. There are no words to respond - its just funny. BTW - he is 3 years old. Nick, in another forum where I post anonymously I replied by saying "that was an Illurion". The repose was "you mean, an illusion"? I said "probably but not really. I mean it's a response which does not make sense, is devoid of facts and is about a question not asked." To be "RED", is to ignore the facts presented, or claim they aren't facts, or "spin" a loss by claiming the facts "do not make sense", and then make matters worse by asking even more irrelevant questions. Why not back up your baseless assertions? Just moments ago you posted an article about Nils Mörner which was devoid of a single fact. My post below it showed what the measured trend was, and that it was increasing. Data barely a month old contradicts the claims. but that doesn't "mean he is wrong." your post was irrelevant, as it did not "prove or dis-prove" anything, just gave someone else's opinion of Morner....... False - I linked to an article in a science paper (the peer reviewed article is behind a pay wall) which showed the measured trend for global sea level was increasing. It is a FACT of science and not an opinion. even yours... I seldom offer an opinion. Morner, on the other hand, pointed out many specific "facts".... I watched the entire video and he did present some charts which were reliable but had nothing to do with his specific claims. For example, the video showed a temperature chart (somewhere from 6:30 to 7:00 minutes in) which only included data to 2013, yet it's now 2019. The hottest years since records have been kept have occurred after 2013. Chinese loans have nothing to do with claims about sea levels. His comments were of no scientific merit. you do not "have" to believe him... He would need to present reasoned evidence - he never did. but that doesn't "mean he is wrong." It means he has no basis for his claims. Yet you regard him highly as a scientist.